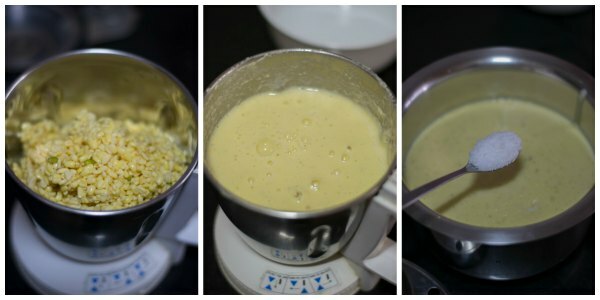 This is a very unique recipe for upma made entirely with moong dal. Its very healthy and very easy to make. This is popular around Coimbatore region and usually made for breakfast. 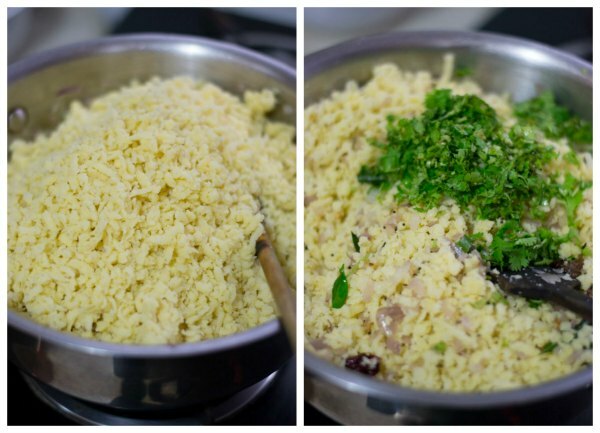 Here is how to do Pasi Payaru Upma. We use split green gram dal with the green skin still on. 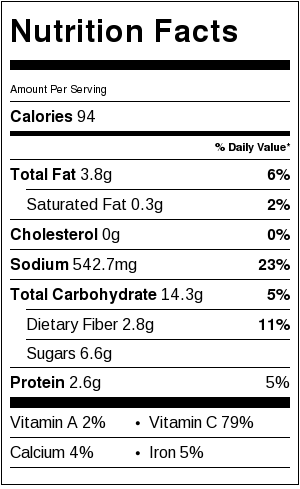 This works well for the recipe. Wash and soak the moong dal in water for 4-5 hours. After soaking, scrub the lentils well between fingers. Wash in running water and drain several times. Drain between your fingers to get rid of the green skin. Repeat the procedure until most of the green skin from the dal has been removed. Some of the skin might still be attached. That’s fine. Set aside. Add around 1 to 1 1/2 cups of water and grind the dal to a smooth paste. Add the salt and mix well. Put some water in an idly vessel and put it on medium flame. Oil the idli plate and gently fill the rounds with the batter. Put it inside the idly vessel , cover the vessel, and let it steam for 15-20 minutes. After around 15 minutes, insert a spoon into the idlis. It should come clean. If it comes clean, the moong dal idlis are done. Remove from heat. Scoop the idlis out of the idli mold onto a plate. 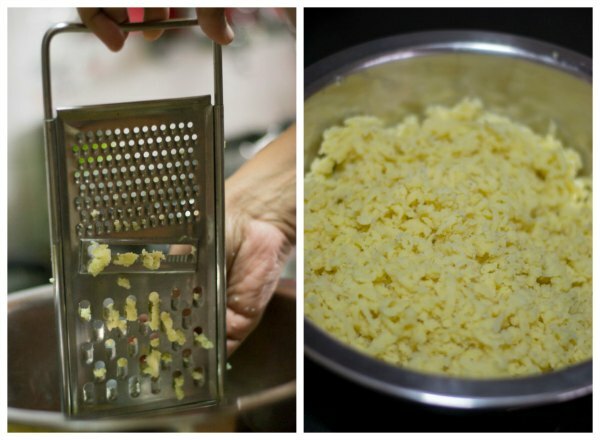 Shred the moong dal idlis using a vegetable shredder. It should resemble shredded cheese. Set aside. Now we will make upma. Heat oil in a pan until hot. Add in the mustard seeds. Let it splutter. Add in the finely chopped ginger, dried red chillies and curry leaves. Fry for a few seconds until fragrant. Add in the chopped onions and green chillies. 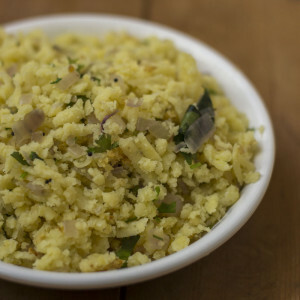 Using a lot of onions in this dish makes the upma very tasty. Fry till the onions are soft. Add in a little salt to taste. 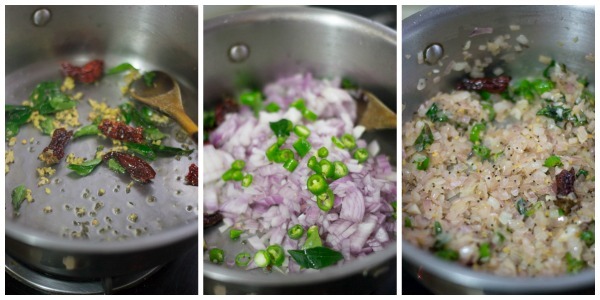 Add in the shredded dal and coriander leaves and mix well to combine. Switch off the flame and serve warm with coconut chutney. 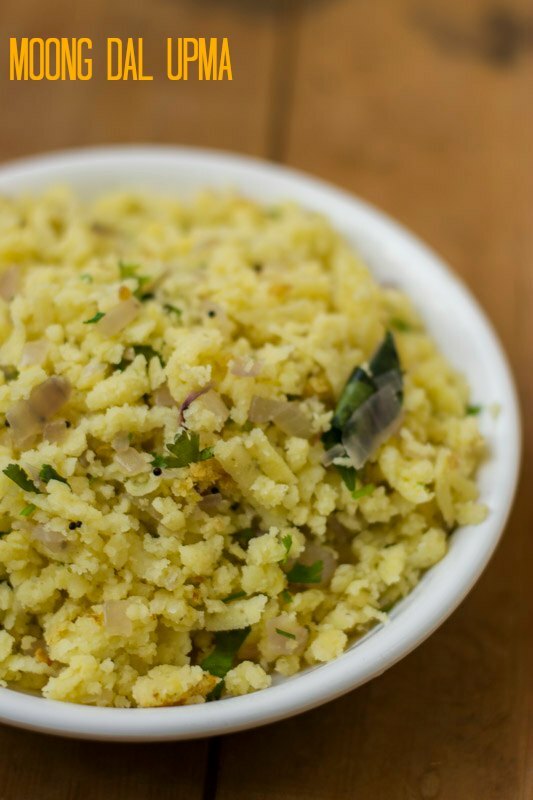 Recipe for healthy pasi payaru upma. green moong dal pulao. Wash and soak the moong dal in water for 4-5 hours. After soaking, scrub the lentils well between fingers. Wash in running water and drain several times. Drain between your fingers to get rid of the green skin. Set aside. Add around 1 to 1½ cups of water and grind the dal to a smooth paste. Add the salt and mix well. Put some water in an idly vessel and put it on medium flame. Oil the idli plate and gently fill the rounds with the batter. Put it inside the idly vessel , cover the vessel, and let it steam for 15-20 minutes. Remove from heat. Scoop the idlis out of the idli mold onto a plate. 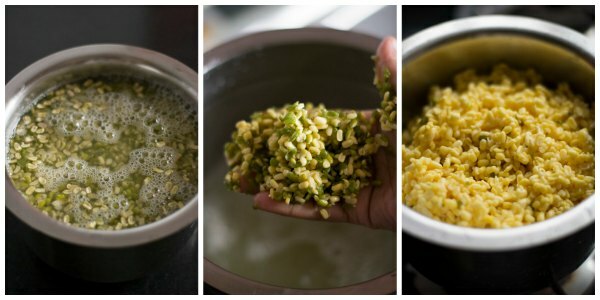 Shred the moong dal idlis using a vegetable shredder. Set aside. 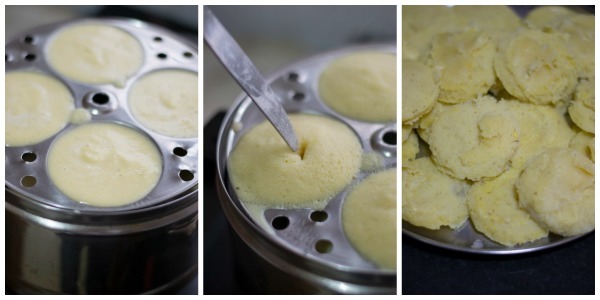 Can the batter be made previous night and stored in the fridge to make idlis the next morning? Otherwise i don’t know how we can do the entire process for breakfast..lol..or can we soak the split moong dal overnight instead of only 4-5 hours? Yes. you can soak the dal overnite. Very innovative recipe. Thanks for Sharing. can we use dry grinder to split the whole mung dal to get split mung dal? i do’t get split variety here. If you dont get split moong dal, you can just use the yellow moong. The dry grinder wont help. The recipe sounds amazing, will be making for sure. I have a couple of questions. What if we don’t wash the skins away? And will this work if we use whole moong? The vada will be too heavy with the skin. It will be hard. Hi Suguna, while making Moong Dal upma can we use moong dal (the yellow one) or the whole moong, instead of split moong? Please let me know. Thanks. we need split moong for this recipe. yellow moong kind of becomes slimy. Thank you Rajam. Really glad that you liked the dish. One of our usual family dinners. Interesting recipe. Almost similar to paruppu usili recipe.. Difference being the type of lentils used. One question- if you are going to wash most of the skin away, can we use yellow moong dal? The texture is little different when using skin on lentils. I think the dehusked ones are little processed in order to remove the skin and folks at home believe that the upma turns slimy with yellow moong dal. I have tried both ways and I find the texture to be little more fluffier with the skin on lentils. Wow.. Awesome recipe.. Great protien rich breakfast. I will definitely give it a try..